However, the egg only got larger and larger, and more and more human2: when she had come within a few yards of it, she saw that it had eyes and a nose and mouth; and when she had come close to it, she saw clearly that it was HUMPTY DUMPTY himself. "It can't be anybody else!" she said to herself. "I'm as certain of it, as if his name were written all over his face." It might have been written a hundred times, easily, on that enormous face. Humpty Dumpty was sitting with his legs crossed, like a Turk3, on the top of a high wall  such a narrow one that Alice quite wondered how he could keep his balance  and, as his eyes were steadily fixed in the opposite direction, and he didn't take the least notice of her, she thought he must be a stuffed figure after all. "And how exactly like an egg he is!" she said aloud, standing with her hands ready to catch him, for she was every moment expecting him to fall. "It's very provoking," Humpty Dumpty said after a long silence, looking away from Alice as he spoke, "to be called an egg  very!" "I said you looked like an egg, Sir," Alice gently explained. "And some eggs are very pretty, you know," she added, hoping to turn her remark into a sort of a compliment. "Some people," said Humpty Dumpty, looking away from her as usual, "have no more sense than a baby!" Couldn't put Humpty Dumpty in his place again." "That last line is much too long for the poetry," she added, almost out loud, forgetting that Humpty Dumpty would hear her. "Don't stand there chattering to yourself like that," Humpty Dumpty said, looking at her for the first time, "but tell me your name and your business." "My name is Alice, but "
"It's a stupid enough name!" Humpty Dumpty interrupted impatiently. "What does it mean?" "Must a name mean something? "5 Alice asked doubtfully. "Of course it must," Humpty Dumpty said with a short laugh: "my name means the shape I am  and a good handsome shape it is, too. With a name like yours, you might be any shape, almost." "Why do you sit out here all alone?" said Alice, not wishing to begin an argument. "Why, because there's nobody with me!" cried Humpty Dumpty. "Did you think I didn't know the answer to that? Ask another." "Don't you think you'd be safer down on the ground?" Alice went on, not with any idea of making another riddle, but simply in her good-natured anxiety for the queer creature. "That wall is so very narrow!" "What tremendously easy riddles you ask!" Humpty Dumpty growled out. "Of course I don't think so! Why, if ever I did fall off  which there's no chance of  but if I did " Here he pursed his lips and looked so solemn and grand that Alice could hardly help laughing. "If I did fall," he went on, "The king has promised me  with his very own mouth  to  to "
"To send all his horses and all his men," Alice interrupted, rather unwisely. "Now I declare that's too bad!" Humpty Dumpty cried, breaking into a sudden passion. "You've been listening at doors  and behind trees  and down chimneys  or you couldn't have known it!" "I haven't, indeed!" Alice said very gently. "It's in a book." "Ah, well! They may write such things in a book," Humpty Dumpty said in a calmer tone. "That's what you call a History of England, that is. Now, take a good look at me! I'm one that has spoken to a King, I am: mayhap you'll never see such another: and to show you I'm not proud, you may shake hands with me!" And he grinned almost from ear to ear, as he leant forwards (and as nearly as possible fell off the wall in doing so6) and offered Alice his hand. She watched him a little anxiously as she took it. "If he smiled much more, the ends of his mouth might meet behind," she thought: "and then I don't know what would happen to his head! I'm afraid it would come off!" "Yes, all his horses and all his men," Humpty Dumpty went on. "They'd pick me up again in a minute, they would! However, this conversation is going on a little too fast: let's go back to the last remark but one." "I'm afraid I can't quite remember it," Alice said very politely. "In that case we start afresh," said Humpty Dumpty, "and it's my turn to choose a subject " ("He talks about it just as if it was a game!" thought Alice.) "So here's a question for you. How old did you say you were?" Alice made a short calculation, and said "Seven years and six months." "Wrong!" Humpty Dumpty exclaimed triumphantly. "You never said a word like it!" "I though you meant 'How old are you?'" Alice explained. "If I'd meant that, I'd have said it," said Humpty Dumpty. "Seven years and six months!" Humpty Dumpty repeated thoughtfully. "An uncomfortable sort of age. Now if you'd asked my advice, I'd have said 'Leave off at seven'  but it's too late now." "I never ask advice about growing," Alice said indignantly. "Too proud?" the other inquired. Alice felt even more indignant at this suggestion. "I mean," she said, "that one can't help growing older." "One can't, perhaps," said Humpty Dumpty, "but two can. With proper assistance, you might have left off at seven." "What a beautiful belt you've got on! "7 Alice suddenly remarked. (They had had quite enough of the subject of age, she thought: and if they really were to take turns in choosing subjects, it was her turn now.) "At least," she corrected herself on second thoughts, "a beautiful cravat, I should have said  no, a belt, I mean  I beg your pardon!" she added in dismay, for Humpty Dumpty looked thoroughly offended, and she began to wish she hadn't chosen that subject. "If I only knew," she thought to herself, "which was neck and which was waist!" "It is a  most  provoking  thing," he said at last, "when a person doesn't know a cravat from a belt!" "I know it's very ignorant of me," Alice said, in so humble a tone that Humpty Dumpty relented. "It's a cravat, child, and a beautiful one, as you say. It's a present from the White King and Queen. There now!" "Is it really?" said Alice, quite pleased to find that she had chosen a good subject, after all. "They gave it me," Humpty Dumpty continued thoughtfully, as he crossed one knee over the other and clasped his hands round it, "they gave it me  for an un-birthday present." "I beg your pardon?" Alice said with a puzzled air. "I'm not offended," said Humpty Dumpty. Alice considered a little. "I like birthday presents best,"8 she said at last. "And if you take one from three hundred and sixty-five, what remains?" "Three hundred and sixty-four, of course." Humpty Dumpty looked doubtful. "I'd rather see that done on paper," he said. Humpty Dumpty took the book, and looked at it carefully. "That seems to be done right " he began. "You're holding it upside down!" Alice interrupted. "To be sure I was!" Humpty Dumpty said gaily, as she turned it round for him. "I thought it looked a little queer. As I was saying, that seems to be done right  though I haven't time to look it over thoroughly just now  and that shows that there are three hundred and sixty-four days when you might get un-birthday presents "
"And only one for birthday presents, you know. There's glory for you!" Humpty Dumpty smiled contemptuously. "Of course you don't  till I tell you. I meant 'there's a nice knock-down argument for you!'" "When I use a word," Humpty Dumpty said in rather a scornful tone, "it means just what I choose it to mean  neither more nor less." Alice was too much puzzled to say anything; so after a minute Humpty Dumpty began again. "They've a temper, some of them  particularly verbs, they're the proudest  adjectives you can do anything with, but not verbs  however, I can manage the whole lot of them! Impenetrability! That's what I say!" "Would you tell me, please," said Alice "what that means?" "Now you talk like a reasonable child," said Humpty Dumpty, looking very much pleased. "I meant by 'impenetrability' that we've had enough of that subject, and it would be just as well if you'd mention what you mean to do next, as I suppose you don't mean to stop here all the rest of your life." "Oh!" said Alice. She was too much puzzled to make any other remark. "Ah, you should see 'em come round me of a Saturday night," Humpty Dumpty went on, wagging his head gravely from side to side, "for to get their wages, you know." "You seem very clever at explaining words, Sir," said Alice. "Would you kindly tell me the meaning of the poem called 'Jabberwocky'?" "Let's hear it," said Humpty Dumpty. "I can explain all the poems that were ever invented  and a good many that haven't been invented just yet." "That's enough to begin with," Humpty Dumpty interrupted: "there are plenty of hard words there. 'Brillig' means four o'clock in the afternoon  the time when you begin broiling things for dinner." "That'll do very well," said Alice: "and 'slithy'?" "Well, 'slithy' means 'lithe and slimy.' 'Lithe' is the same as 'active.' You see it's like a portmanteau  there are two meanings packed up into one word." "I see it now," Alice remarked thoughtfully: "and what are 'toves'?" "Well, 'toves' are something like badgers  they're something like lizards  and they're something like corkscrews." "They must be very curious looking creatures." "They are that," said Humpty Dumpty: "also they make their nests under sun-dials  also they live on cheese." "And what's the 'gyre' and to 'gimble'?" "To 'gyre' is to go round and round like a gyroscope. To 'gimble' is to make holes like a gimblet11." "And 'the wabe' is the grass-plot round a sun-dial, I suppose?" said Alice, surprised at her own ingenuity. "Of course it is. It's called 'wabe,' you know, because it goes a long way before it, and a long way behind it "
"And then 'mome raths'?" said Alice. "I'm afraid I'm giving you a great deal of trouble." "Well, a 'rath' is a sort of green pig: but 'mome' I'm not certain about. I think it's short for 'from home'  meaning that they'd lost their way, you know." "And what does 'outgrabe' mean?" "Well, 'outgrabing' is something between bellowing and whistling, with a kind of sneeze in the middle: however, you'll hear it done, maybe  down in the wood yonder  and when you've once heard it you'll be quite content. Who's been repeating all that hard stuff to you?" "I read it in a book,"13 said Alice. "But I had some poetry repeated to me, much easier than that, by  Tweedledee, I think it was." "As to poetry, you know," said Humpty Dumpty, stretching out one of his great hands, "I can repeat poetry as well as other folk, if it comes to that "
"Oh, it needn't come to that!" Alice hastily said, hoping to keep him from beginning. "The piece I'm going to repeat," he went on without noticing her remark, "was written entirely for your amusement." Alice felt that in that case she really ought to listen to it, so she sat down, and said "Thank you" rather sadly. only I don't sing it,"14 he added, as an explanation. "I see you don't," said Alice. "If you can see whether I'm singing or not, you've sharper eyes than most. "15 Humpty Dumpty remarked severely. Alice was silent. I'll try and tell you what I mean." "Thank you very much," said Alice. Take pen and ink, and write it down." "I will, if I can remember it so long," said Alice. "You needn't go on making remarks like that," Humpty Dumpty said: "they're not sensible, and they put me out." 'We cannot do it, Sir, because '"
"I'm afraid I don't quite understand," said Alice. "It gets easier further on," Humpty Dumpty replied. Humpty Dumpty raised his voice almost to a scream as he repeated this verse, and Alice thought with a shudder, "I wouldn't have been the messenger for anything!" I tried to turn the handle, but "
"Is that all?" Alice timidly asked. "That's all," said Humpty Dumpty. "Good-bye." This was rather sudden, Alice thought: but, after such a very strong hint that she ought to be going, she felt that it would hardly be civil to stay. So she got up, and held out her hand. "Good-bye, till we meet again!" she said as cheerfully as she could. "I shouldn't know you again if we did meet," Humpty Dumpty replied in a discontented tone, giving her one of his fingers to shake: "you're so exactly like other people." "That's just what I complain of," said Humpty Dumpty. "Your face is the same as everybody has  the two eyes, so " (marking their places in the air with this thumb) "nose in the middle, mouth under. It's always the same. Now if you had the two eyes on the same side of the nose, for instance  or the mouth at the top  that would be some help." "It wouldn't look nice," Alice objected. But Humpty Dumpty only shut his eyes and said "Wait till you've tried." Alice waited a minute to see if he would speak again, but as he never opened his eyes or took any further notice of her, she said "Good-bye!" once more, and, getting no answer to this, she quietly walked away: but she couldn't help saying to herself as she went, "Of all the unsatisfactory18 " (she repeated this aloud, as it was a great comfort to have such a long word to say) "of all the unsatisfactory people I ever met " She never finished the sentence, for at this moment a heavy crash shook the forest from end to end. "Humpty Dumpty" is a very old nursery rhyme, first recorded in writing and published, according to Wikipedia, in 1797. The idea that it started out as a sort of riddle is quite interesting, because as a a riddle it depends on linguistic puns and cultural information that have since passed out of currency. I'm not sure that "more and more human" is a very good description here, though the main point is that the mysterious egg turns out to have limbs and a face that is relatively realistic, as opposed to the hyper-simplified faces of many children's book characters. Facial recognition may seem quite simple, but as various software engineers have discovered, it is not so simple. One of the photo-editing programs on my computer performs automatic facial recognition, usually not too badly. It picks up on faces on coins for example, even fairly worn ones in some cases, which is impressive. It's the howlers that suggest what sort of heuristic is being applied. One photograph in particular has no people, coins or anything else that people would expect to suggest a face, it's actually a landscape. The facial recognition algorithm insists nonetheless that there are mysterious, blobby faces in a couple of different places. There aren't, but what is clear from the result is that effectively it checks for eyes, nose and mouth, logically enough. Apparently the algorithm is based on idealized, "average" shapes for those facial features, probably including averaged distances between them. The software engineers remain puzzled how to modify the algorithm to do something that we do all the time: disentangle patterns that may suggest a face from real faces. It makes sense that filtering patterns suggestive of faces from real faces is difficult. There isn't an obvious general rule or average that could be used, having the person using the program confirm whether there are faces in the photographs or not is not optimal either because it's an inconvenience to the person and not really useful. Plus, there is a great deal of cultural information that we use to sort out what counts as a "real face" and what that means (i.e. should we try to talk to the owner of the face, should we look twice to make sure we haven't misinterpreted what we saw out of the corner of our eye, etc.). Actually, that last point may be the key to the description of Humpty Dumpty's face as "more and more human" as Alice approaches him. As she approaches him, Alice gets a hint that there is a sort of face on the egg she purchased, but until she comes closer still she can't tell whether it's an animated face, the face of a being she can interact with. Since originally annotating this chapter, I have happened on an excellent project showing how it is way more interesting to see how the software gets face recognition wrong, or to see how the algorithm copes with random data. Have a look at Robby Kraft's Faces Project, apparently completed as part of a residency or other period of work at the School for Poetic Computation in new york. His results are both intriguing and weird. In other words, Humpty Dumpty was sitting cross-legged on top of the narrow wall, so it is no surprise at all his perch is precarious. Several on-line sources commented that this posture is called "tailor style." As it happens, I can verify this courtesy of the well-illustrated books that have been published recently on Victorian-era fashions in response to the Steampunk-maker movement. I found one text that focussed particularly on men's clothing, which included an illustration of the back room of a period tailor's shop. The room included a large table on which the apprentice tailors literally sat cross-legged with their materials arranged around them in a fixed order, sewing up garments. Ah, here is the book reference: The Victorian Tailor: An Introduction to Period Tailoring. This initial refusal to actually interact properly with Alice plus his complaints that people's faces are too alike to easily told apart has encouraged some commentators to suggest that Humpty Dumpty suffers from some brain disorder. The most popular suggestion is that he suffers from prosopoagnosia, inability to recognize different faces. However, the simpler hypothesis is that Humpty Dumpty is arrogant and insufferably rude, as Alice ultimately finds. All names do mean something, though it may happen that they are so old that their meaning is lost. The Online Etymology Dictionary states that "Alice" means "nobility" from an Old High German name via Old French. This puts me in mind of the dreadful blow-up clowns with a chamber filled with sand in their bottoms. These were intended to be fun toys for active children, specifically boys, who were encouraged to "box" with them as they are difficult to knock over for a child as opposed to an adult. However, like many people, I have always found the weird, manically smiling visage of this sort of toy rather disturbing. The mismatch between the facial expression and how the toy is expected to be treated, and the peculiar messaging this may give small children is thought-provoking by itself. The expression mismatch is probably a key reason so many people find clowns frightening: their painted smiles may not match their actual mouth or the expression in their eyes. A news article reporting on the results of a psychological study of people's response to altered photographs of public figures drew out the point that a true smile involves both the eyes and mouth, and that we are actually quite sensitive to this. In fact, that's why so many photographs where everyone has to say "cheese" look so awful, and why professional photographers take several shots, because after the first two or three people relax, and then really smile. 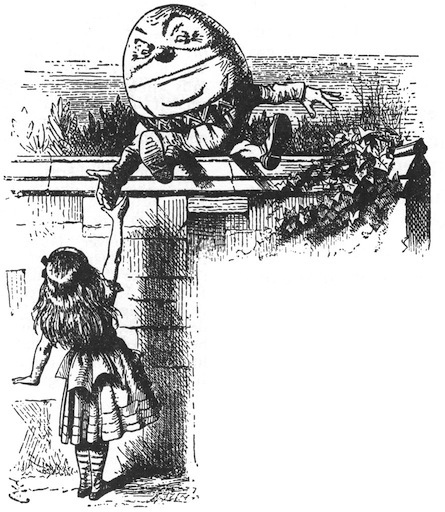 Tenniel's illustration is not entirely ambiguous on the point of Humpty Dumpty's cravat. It is definitely represented as above his shoulders, though to be fair he has unobvious shoulders even where he is shown shouting at the messenger. The indirect question about what makes a gift special is the puzzle here. Humpty Dumpty is arguing rather indirectly that a gift is made special by you not expecting to receive it, and so his insistence that un-birthday presents are better is not just about how many opportunities there are to receive one, but the element of chance. Alice on the other hand is indirectly arguing that a long-anticipated present is better, particularly one that comes on a regular basis. Neither of them makes it clear whether the gift itself is a surprise, that is whether it comes wrapped up in a box and so is not identifiable until unwrapped. This exchange neatly encapsulates the question of linguistic determinism. There is a whole essay on that topic elsewhere at the Moonspeaker. Nonsense though much of this verse is, it still seems to make sense because it is follows the usual rules of grammar, and Lewis Carroll's invented words follow the "shape rules" of english words. That is, they have acceptable sound combinations in the different parts of the word. That the verse is shaped by the usual grammar rules is especially powerful, because that enables us to conjecture what category each of the nonsense words belong in. For example, "the mome raths outgrabe" implies the usual subject-verb-object order of english. So we can look at it and label "mome" an adjective, "raths" a noun, and "outgrabe" a verb on that basis. Adjective versus noun labelling would be trickier in a language like french, where some adjectives are placed only before or after the noun, though others can be in either position while having slightly different meanings. These ideas come in handy in any sort of deciphering work. Also spelled "gimlet," this is a t-shaped tool, the handle being the top of the "t." It's working end is sharpened and may be threaded for boring holes in wood. They are a sort of heavy duty version of the awl, a very similar tool used for punching holes in leather, though the handle is usually of a different shape. Not so implausible in waking life, as it happens. Massive, illustrated books of nursery rhymes were a commonplace right until the development of the web led to the posting of published literature that is out of copyright. This was mainly a good thing, though in the case of these nursery rhyme collections it often coincided with the complete loss of the accompanying illustrations due to the earlier technical limitations on providing images on-line. 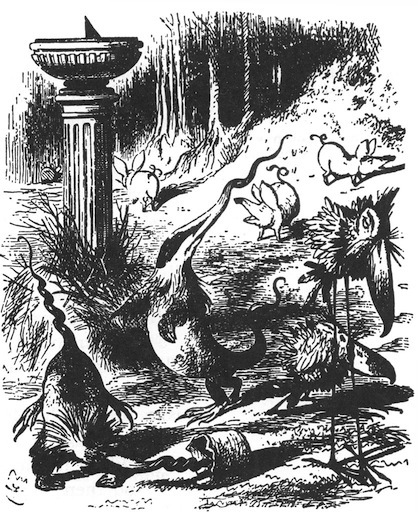 The original books included nonsense poems by anonymous authors, as well as those written by Edward Lear. Students of ancient Greek will recognize the pun here, as will those who have read a good translation of the Iliad. The first line may be translated as ,"Sing Goddess, the destroying wrath of Achilles, son of Peleus..." though few of us reading the poem aloud in translation or the original would literally sing. Practically speaking, performing bards probably never "sang" works like the Iliad either, opting instead for a rhythmic chant. Humpty Dumpty is being unjust here; the body language of singing is different from that of recital, even if what is being recited is something with rhythm and rhyme. The kettle shown in the illustration is far too large to be a common tea kettle. Larger-sized kettles were important tools before hot running water was commonly available in homes. Until then, someone, usually a woman of the household, would have to heat all the water required for cleaning and washing. While she could do this in a larger pot, it made far more sense to use a large kettle as it had the advantages of a spout and a lid to curb splashing and spills. A little thought will quickly disabuse anyone of the idea that this constituted light work. Even if the woman could heat a large kettle on a stove rather than over a fire, the physical labour of filling and moving the kettle before and after heating would be far from trivial. In the metric system, the basic unit of mass is derived from that of a litre of pure water at the melting point, which is 1 kilogram (about 2.2 pounds). 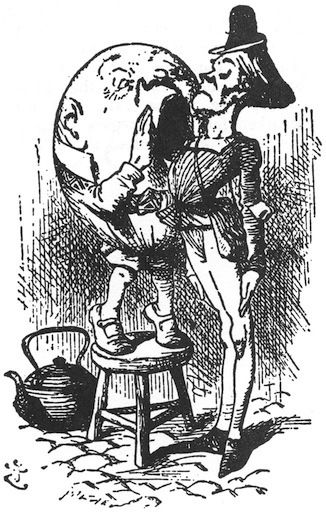 A typical tea kettle holds about two litres of water; a larger heating kettle such as that sitting on the floor by Humpty Dumpty's stool in the illustration probably held no more than 20 litres. For a person of average height, that is probably as much water as can be comfortably carried using a vertical handle. Wherever possible then, women avoided having to haul hot water around their homes. The best thing available in the early 1900s were built in "boilers" or "coppers." If you were especially well-off, you could have one of these in your outhouse (clearly a more substantial affair than the typical outhouse today) and in your kitchen. An excellent photograph of a boiler installed in an outhouse is provided at Join Me in the 1900s. The footwear of Humpty Dumpty and the messenger in the illustration holds a story all its own. The messenger is dressed in medieval-era clothing as opposed to Humpty Dumpty's more modern costume, including the vexed cravat (named from the french term for a croatian, because croation mercenary soldiers customarily wore them according to my electronic OED). The messenger's pointy-toed footwear is definitely medieval in european terms, though this type of shoe is much older and likely was introduced from the middle east. I have read in one traveller's guidebook to Turkey that when these were made on a stiffer sole and the toe turned up, that this responded to the needs of shepherds clambering along the rough slopes where their pastures were. I can't help but wonder if the writer or the original reporter of this tidbit was playing a joke. Humpty Dumpty meanwhile is wearing a type of shoe that has been making a bit of a come back. These shoes are familiar to many of us who grew up with pre-Disney fairy tale compilations, in which all humans were depicted in later period medieval dress. I have them referred to as "ankle-strap shoes," and they were overwhelmed I suspect by the advent of shoe laces. There are two modern sorts of shoes with a shape very similar to what Humpty Dumpty is wearing that I have seen both women and men wearing: "Crocs" and Berkenstock sandals. As a mode of keeping shoes on our feet, ankle straps certainly aren't restricted to shoes of this particular shape, as "heel shoes" or newer, moccassin-like running shoes attest. Satisfaction is not guaranteed when purchasing eggs, it seems, a possibility Alice bore in mind in the previous chapter when she opted to by just one egg though it was more expensive. A satisfaction guarantee seems to be a relatively new innovation  it seems that originally the latin phrase "caveat empor" was followed quite strictly. It was up to the purchaser to know enough to sort out bad eggs from good ones for instance, or to put up with what they could get if selection was limited. "Satisfaction guaranteed or your money back" has to be acknowledged as a bit of marketing genius, and according to The Encyclopedia of Chicago that bit of genius came from someone working at the Montgomery Ward Mail Order Company. In that context the innovation makes particular sense, because as a mail order customer you couldn't inspect what you were buying before purchase. Curiously, despite this association with marketing innovation, and even though Montgomery Ward survived over a century, the company never made the transition to shopping by internet and shut down abruptly in 2000.